Item No. : Cargo Carrier Bag-K-58 ''. 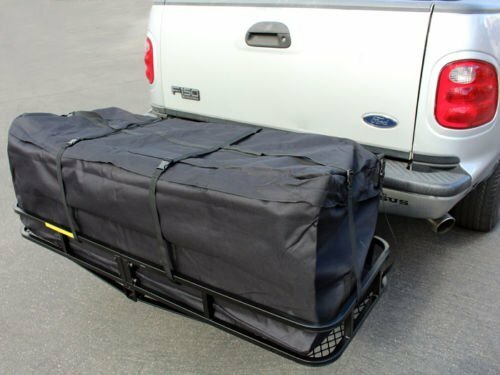 Waterproof Cargo Carrier Bag protects luggage and other items on your hitch-mount cargo carrier from road grit, sun damage and rain. The Bag features weather-resistant heavy duty construction and folds up for easy storage. Comes with 8 tie-down straps for securing to the cargo carrier or an existing vehicle roof rack. Expands from 20" to 27" in width with a zipper. Size: 58"L x (expandable 20-27" wide) x 19 1/2"H.
Note: This product is a cargo bag only and all cargo carriers shown in pictures are sold separately. Expendable Waterproof Cargo Carrier Bag. High quality and 100% brand new. View More In Soft-Shell Carriers. If you have any questions about this product by Diking, contact us by completing and submitting the form below. If you are looking for a specif part number, please include it with your message.